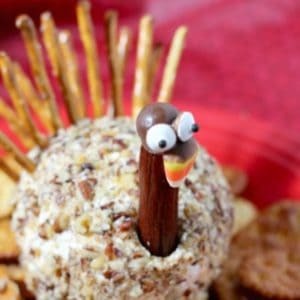 This holiday cheeseball turkey is a fun appetizer to make for Thanksgiving or fall parties or family get togethers. This turkey is sure to be the talk of the party, it would make a great table centerpiece! If you have never made a cheese ball, they are actually pretty easy to make. Just keep in mind that you need to start working on it the day before you are going to serve it. Let the cream cheese set out for an hour or so to soften before starting. Place softened cream cheese, grated cheese, garlic powder, and minced onion in a small bowl. Wash your hands really well and then mix the cream cheese and grated cheese together with your hands. You can use a food processor, but it is alot easier to do it with your hands. Form the cheese mixture into the shape of a small ball and wrap with waxed paper or plastic wrap. Let sit in the refrigerator overnight to harden. Remove cheese ball from refrigerator and smooth the ball with your hands until it is a round smooth shape. Roll the ball in chopped pecans. Now it’s time to turn your cheeseball into a turkey. The pepperoni stick will be the neck of the turkey. Cut the pepperoni to the size you want. I cut about 3 inches for my turkey’s neck. You are going to use the chocolate melts to “glue” the rest of the turkey’s head together. Place them in a microwaveable bowl and microwave them for 1 minute. Stir, and then microwave for another 30 seconds or so or until the chocolate is melted. (You can use chocolate chips instead, but the chocolate melts seem to harden better for this sort of project). Place a bit of melted chocolate on one end of the pepperoni stick. Stick a Whopper on top of the chocolate and hold it in place for a minute or two. Place a bit more of melted chocolate on the Whopper to glue the candy eyes on (see photo), then glue the candy corn nose in place. It will take a few minutes for the chocolate to harden completely. You can gently place your turkey in the freezer for a few minutes to make the chocolate harden more quickly. 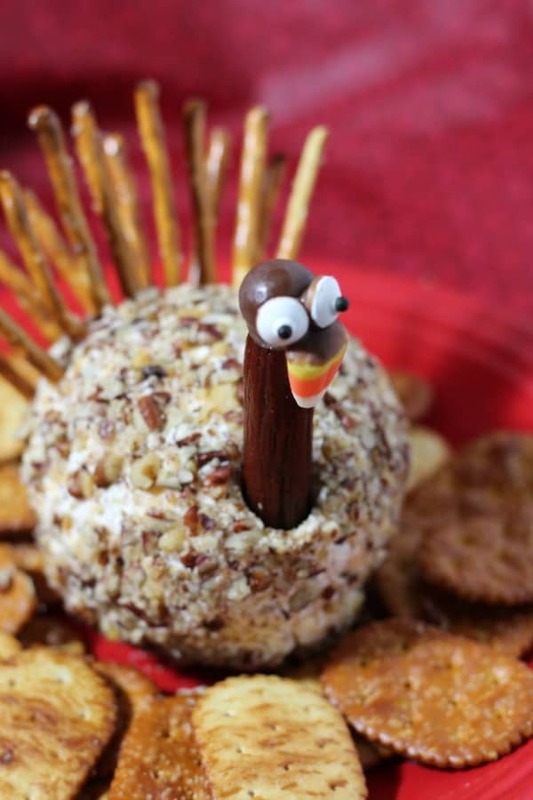 Place the turkey’s head on its cheeseball body, and then use pretzel sticks to create a tail (see photo). Refrigerate cheeseball until ready to serve. If you are storing more than a day or two, you might want to wrap the turkey head and cheeseball separately in plastic wrap and then assemble the turkey when you are ready to serve it. This cheeseball will serve 8-10 people. That’s it! Have fun, and enjoy. Happy Thanksgiving! Like this recipe? You might also like this recipe for an adorable pinecone cheeseball. 2 Comments on "Cheeseball Turkey"